Apparently on the same chromosome 22, APOL1(apolipoprotein -1) and MHY9 sit next to each other. The studies are now showing that due to natural selection and linkage disequilibrium, the APOL1 gene might be the strong candidate for a gene that is responsible for increased incidence of renal disease in African Origin Americans. What is more interesting is why did this selection process happen? 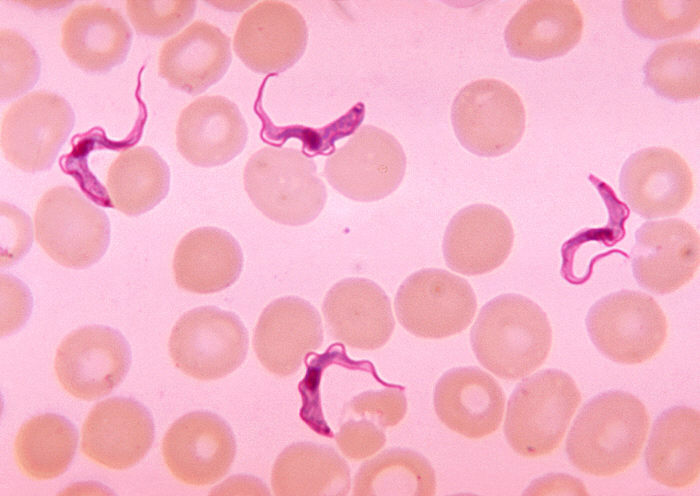 A nice analogy is like Sickle Cell and Malaria- here the association seems to be Trypanosoma Brucei, parasite commonly found in Africa that causes sleeping sickness and FSGS. So having this mutation protects you against sleeping sickness but puts you at higher risk now of FSGS and glomerular diseases and more accelerated sclerosis. A little something on Sleeping Sickness also called African Lethargy or Trypananosomiasis. It is transmitted by the tsetse fly. The disease is endemic in some regions of sub-Saharan Africa, covering about 36 countries and 60 million people. It is estimated that 50,000 to 70,000 people are currently infected, the number having declined somewhat in recent years. Four major epidemics have occurred in recent history: one from 1896–1906 primarily in Uganda and the Congo Basin, two epidemics in 1920 and 1970 in several African countries, even a recent epidemic in 2008. The symptoms occur in two stages. The first stage is known as the haemolymphatic phase and is characterized by fever, headaches, and joint pains, and itching. If left untreated, the disease overcomes the host's defenses and can cause more extensive damage, broadening symptoms to include anemia and multi organ failure. The second stage, called the the sleeping phase and leads to more confusion and involvement of the CNS system leading to drowsiness and hence the disease's name. Apparently, this disease can be transmitted vertically and via sexual means as well!! The link to APOL1 was first noted when a new treatment based on a truncated version of the apolipoprotein L-1 of HDL and a single domain antibody was found to work in mice. And now this organism's long history is causing kidney diseases due to what some might call "epi genetic phenomenon"
This is fascinating and exciting new theories. Lets see what more studies pan out.